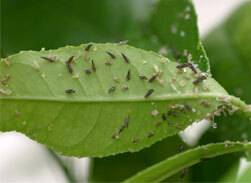 The Asian citrus psyllid (ACP) is 3 to 4 millimeters long with a brown mottled body. The head is light brown. The wings are broadest in the apical half, mottled, and with a dark brown band extending around the periphery of the outer half of the wing. The insect is covered with a whitish waxy secretion, making it appear dusty. Nymphs are generally yellowish orange in color, with large filaments confined to an apical plate of the abdomen. The eggs are approximately 0.3 millimeters long, elongated, and almond-shaped. Fresh eggs are pale in color, then, turn yellow, and finally orange at the time of hatching. Eggs are placed on plant tissue with the long axis vertical to the surface of the plant. Asian citrus psyllid was first found in the United States in Palm Beach County, Florida, in June 1998 in backyard plantings of orange jasmine. By 2001, it had spread to 31 counties in Florida, with much of the spread due to movement of infested nursery plants. In the spring of 2001, Asian citrus psyllid was accidentally introduced into the Rio Grande Valley, Texas on potted nursery stock from Florida. It was subsequently found in Hawaii in 2006, in Alabama, Georgia, Louisiana, Mississippi, and South Carolina in 2008. ACP was first found in California on August 27, 2008 in San Diego County. Subsequent to this initial detection in San Diego County, the ACP has been detected in Alameda, Contra Costa, Fresno, Imperial, Kern, Kings, Los Angeles, Madera, Merced, Monterey, Orange, Placer, Riverside, San Benito, San Bernardino, San Joaquin, San Luis Obispo, San Mateo, Santa Barbara, Santa Clara, Solano, Stanislaus, Tulare, Ventura, and Yolo counties. The ACP has the potential to establish itself throughout California wherever citrus is grown. ACP is found in tropical and subtropical Asia, Afghanistan, Saudi Arabia, Reunion, Mauritius, parts of South and Central America, Mexico, the Caribbean, and in the U.S. (Alabama, Arizona, California, Florida, Georgia, Hawaii, Louisiana, Mississippi, South Carolina, and Texas). Eggs are laid on tips of growing shoots on and between unfurling leaves. Females lay 300 to 800 eggs during their lifetime. Nymphs pass through five instars. The total life cycle requires from 15 to 47 days, depending on environmental factors such as temperature and season. The adults may live for more than a month. There is no diapause, but populations are typically low in the winter or during dry periods. There are 9 to 10 generations a year, with up to 16 observed under observation in field cages. The ACP feeds mainly on Citrus spp., at least two species of Murraya and several other genera all in the family of Rutaceae. Damage from the psyllids occurs in two ways: the first by drawing out of large amounts of sap from the plant as they feed and, secondly, the psyllids produce copious amounts of honeydew. The honeydew then coats the leaves of the tree, encouraging sooty mold to grow which blocks sunlight to the leaves. However, the most serious damage caused by ACP is due to its ability to effectively vector three phloem-inhabiting bacteria in the genus Candidatus Liberibacter, the most widespread being Candidatus Liberibacter asiaticus. These bacteria cause a disease known as huanglongbing, or citrus greening. In the past, these bacteria have been extremely difficult to detect and characterize. In recent years, however, DNA probes, electron microscopy, and enzyme-linked immunosorbent assay tests (ELISA) have been developed that have improved detection. Symptoms of huanglongbing (HLB) include yellow shoots, with mottling and chlorosis of the leaves. The juice of the infected fruit has a bitter taste. Fruit does not color properly, hence the term “greening” is sometimes used in reference to the disease. Huanglongbing is one of the most devastating diseases of citrus in the world. Once infected, there is no cure for the disease and infected trees will die within ten years. The once flourishing citrus industry in India is slowly being wiped out by dieback. This dieback has multiple causes, but the major reason is due to HLB. In California, the disease has only been found in residential areas of Los Angeles and Orange counties.